The Cuisinart CGS-6010 is a 10 piece carousel grill tool set which includes all the necessary tools to make grilling experience easy and convenient. This durable set of stainless steel tools includes a chef’s spatula, locking grill tongs, a basting brush, a meat hook, and 5 skewers. Each tool is designed with elongated handles and a hanging ring for convenient placement during grilling time. The carousel stand rotates to give better access to tools while grilling. The Cuisinart Carousel Grill Tool Set (10-Piece) has many exciting features for users of all types. 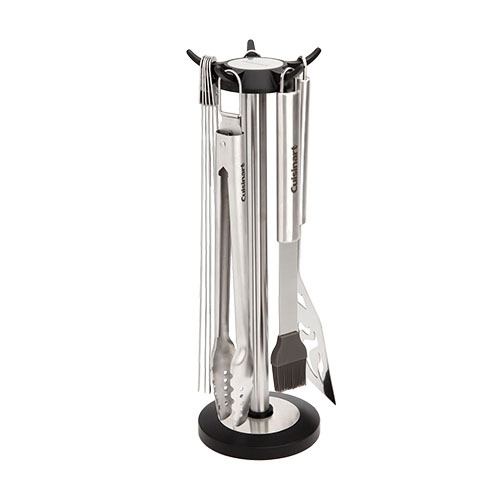 See the Cuisinart Carousel Grill Tool Set (10-Piece) gallery images above for more product views. 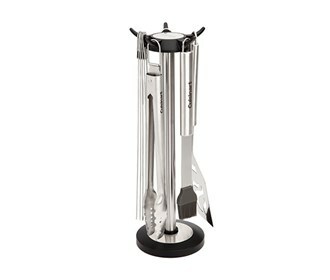 The Cuisinart Carousel Grill Tool Set (10-Piece) is sold as a Brand New Unopened Item.